Home > Microfiber Products > Autogeek Detailing Cover-Up Towel New Look! Autogeek Detailing Cover-Up Towel New Look! Protect plastic windshield cowling and convertible tops from compound and polish splatter! Perfect way to protect your vehicle for some detail work! The Autogeek Detailing Cover-Up Towel is a 25 x 68 inch microfiber towel made to protect the windshield and wiper cowl from buffer sling and splatter. The Autogeek Detailing Cover-Up Towel helps you work clean in order to protect the vehicle and prevent unnecessary cleanup later. 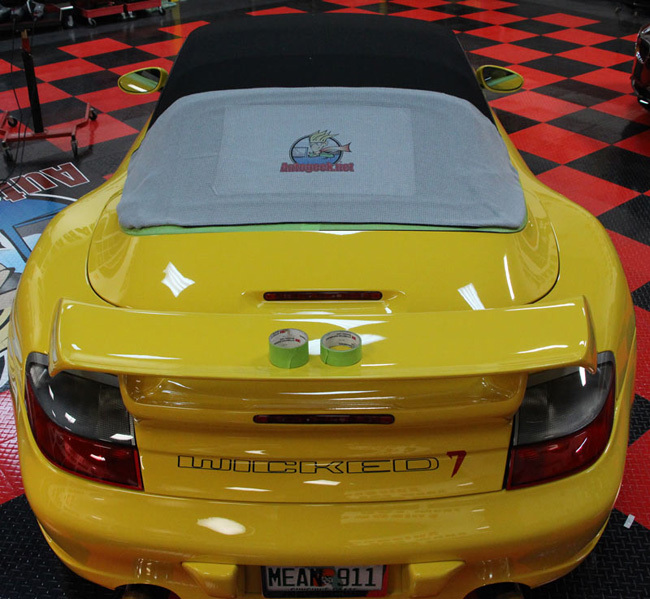 The Autogeek Detailing Cover-Up Towel is used to protect the windshield and plastic wiper cowl from buffer sling. You know, the little white dots of polish that go everywhere if you lift the buffer while it's spinning. It happens, but you can keep it off the windshield with this towel. Compounds and polishes are tough to completely remove from glass and plastic. The cowl is typically black plastic, which means a polish can easily discolor it. It's best to cover the whole area and save yourself the time and trouble of cleaning up later. The Autogeek Detailing Cover-Up Towel is designed to give detailers like you a soft microfiber towel large enough to cover and protect windshields and the wiper cowls beneath the windshields. Many detailers already use cotton beach towels, paper or plastic, but the Autogeek Detailing Cover-Up Towel beats all of them. First of all, it's microfiber so it's softer than any of those other materials. You use microfiber towels for buffing because you know they are gentle. The towel you use to mask off parts of your vehicle should be just as soft. The Autogeek Detailing Cover-Up Towel is gigantic! Unlike bath towels or most detailing towels, it is big enough to cover the majority of most windshields or any other large area you wish to protect. The soft 80/20 microfiber is gentle on all vehicle surfaces, including glass. Tape the towel across the windshield or drape it over painted panels without fear of scratching. In addition to being soft and safe, the Autogeek Detailing Cover-Up Towel is made to last detail after detail. Microfiber is manmade and extremely durable. Wash it and reuse it countless times. 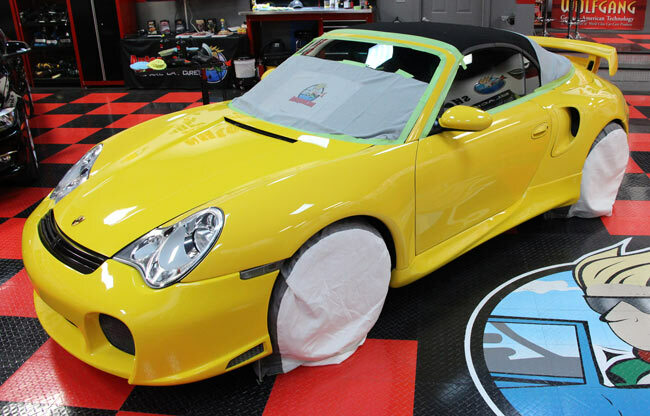 For the best results, use painter's tape or detailer's masking tape to secure the edges of the towel to your vehicle. Masking tape peels off easily and leaves no mess. When masking off the wiper cowl and windshield, open the hood and tape the edge of the towel so that it doesn't interfere with the hood hinges and do not tape the towel to a hot engine. Carefully tape the top and sides of the towel so that glass and all black plastic surrounding it are covered. This preparation takes a little extra time at the beginning of the detail, but it saves you a lot of time at the end and ensures clean, professional results. Tip: When covering the back windshield with the Autogeek Detailing Cover-Up Towel, place a double row of tape at the lower edge where the glass meets the paint. When you're buffing, the tape serves as a barrier so you can work right up to the edge without the pad getting snagged on the towel. Work clean with the Autogeek Detailing Cover-Up Towel. Been using beach towels for years. This AG logo towel serves better and looks more professional. ProsRight size for the job, good quality mf towel. Good for mobile detailing to cover most part of wind shield, the result is a cooler interior for detailing work. Nice towel to use for covering up larger surface areas to protect them from splatter. been waiting for the Autogeek cover up towels to come back in stock for a while. not only do they look good but they are fantastic for covering up areas of paint, trim, glass etc , where you do not want polish or chemicals to end up. one towel covers a large area. these are safe and will not scratch your paint . a little time spent covering up keeps you from spending hours cleaning up a mess. once you start using these you will wonder how you did without them .